I always considered the idea of a humanoid robot as totally over the top and only worthy of doubtful science fiction. Yet it seems to be happening. We can even imagine the mass production of these devices at a cost effective level. Suddenly we have servants whose duty is to keep us pampered. More practically, such devices will be immensely valuable in agriculture. Hand harvesting is very important as is hand maintenance of crops. Weeds need to be removed gently at pretty well the right time. Pests need to be observed and removed or locally dealt with. We can do it but there is never enough hands. At the same time our entire culture will ultimately need to do a complete reset in order to work with their new servants. We also need to all participate in physical labor in order to maintain personal health and general tone and skills. Ideally this occurs because we are doing useful work that is not particularly risky or extreme. We will get a system that combines human physical flexibility with machine power and potential ruggedness to take over the outright maintenance of our world on a global scale. Getting robots to manoeuvre objects with precision has posed many problems for engineers in their quest to build humanoid machines to serve as domestic aides, emergency rescuers or factory workers. Industrial robotic "grippers" already exist that are able to grasp objects and move them but are unable to handle items as a human hand would -- grasping an egg without breaking it but also lifting heavy, bulky things. It has also proved difficult to size prototypes on human measurements. The team from Italy and Germany built a hand using strings that are twisted by small, high-speed motors in five fingers, each with three segments. Dubbed the Dexmart Hand, the device was able to handle a delicate Easter egg and lift a five kilogram load, the team reported. "We used the human hand as our model," researcher Claudio Melchiorri from Italy's University of Bologna said in a statement issued by CORDIS Features, an agency that highlights EU-funded technological research. "This provides the ultimate example of dextrous manipulation." The hand also has a primitive "brain". 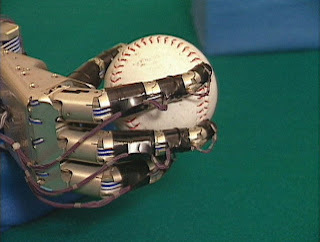 Light sensors were attached to the hand, making it possible to calculate the force required for the fingers to grasp an object without squashing it or losing its grip. "The capability of the robotic hand is so near to that of humans that the vision of robots as personal assistants in the household, in the operating room as well as in industrial settings is becoming ever more realistic," said fellow Bologna researcher Gianluca Palli.